Senior Israeli diplomatic official says Israel prefers to exhaust efforts to reach Gaza ceasefire but is also ready to act if talks fail. A senior Israeli diplomatic official on Friday discussed the Qatari deal being negotiated with Hamas, under Egyptian mediation, which would include transferring fuel and salaries to Gaza in exchange for a lull in the ongoing violence. The official said that Israel prefers to reach an agreement that will result in a ceasefire but is ready to act forcefully if the talks fail and the violence continues. 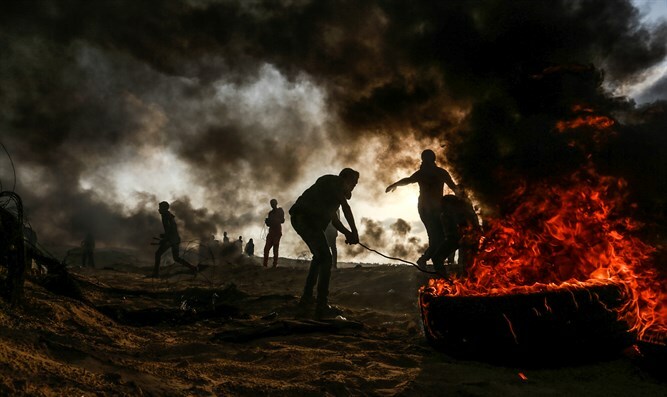 “The possibility of reaching an agreement that will fix what is blowing up the situation in Gaza – and that is the humanitarian situation – must be exhausted. We are able to solve it, at least temporarily, through these arrangements, both for fuel and for controlled salaries. [The deal] was very close to not being made, and it may also fail. It can even fail within the next hour, and we are prepared for the second possibility. That is, if things blow up, we are prepared to exert a great deal of force,” said the official. The official added that it would be preferable for Palestinian Authority (PA) chairman Abbas to pay the salaries of PA employees in Gaza instead of Qatar. Qatar recently agreed to supply fuel deliveries to Gaza for a period of six months. The agreement was brokered by the UN and Egypt and left out the PA, which then announced it will no longer work with UN envoy Nickolay Mladenov. Friday’s comments came as the weekly protests along the Gaza-Israel border were the quietest in months. The violent border riots, which have been occurring every week since March 30, included Gazans attempting to infiltrate into Israel, as well as using kites and balloons with explosives attached in order to set fire to Israeli property. Thousands again gathered in several sites across the border Friday but largely stayed away from the barrier, AFP reported. At a demonstration east of Gaza City, Hamas security personnel were seen preventing protesters from getting too close to the fence, the report said. Unlike previous protests, demonstrators did not fly kites with attached incendiary devices across the border to set fire to Israeli farmland, and few tires were burned.